A stretch of the Oxford Canal north of Rugby is being made more water vole-friendly by Warkwickshire Wildlife Trust with the help of a £61,600 grant. The Heritage Lottery Fund grant will go towards surveying canals and rivers across north Warwickshire for the endangered species. Their habitat will also be enhanced by planting wildflowers, coppicing the bankside and building platforms where the bank is concreted to allow water voles to get out of the water easier. In terms of Rugby borough, the trust will be working on the canal from around Ansty down to the Fosse Way. More volunteers are needed to carry out the work though and the trust is calling on anyone interested in ‘saving Ratty’ to get involved. “We need help from more volunteers to make sure Warwickshire’s water voles don’t make another disappearing act,” wetlands project officer Tim Precious said. The project, Saving Ratty, is aiming to help the small number of water voles found in north Warwickshire thrive after numbers plummeted since being given a starring role in Wind in the Willows in 1908. The trust is training people to help conserve the waterways and working to enhance the river and canal bank habitat to help water voles move freely, with more nesting and feeding opportunities. Six kilometres of waterways were surveyed for water voles in 2015-2016 and in 2017, staff and volunteers plan to survey even more, covering up to 8km. The trust has run 12 training sessions and volunteer days along key corridors for water vole and is running many more activities throughout 2017, especially with the survey season starting in April. Heritage Lottery Fund West Midlands head Vanessa Harbar said: “We’re delighted that money raised by National Lottery players can support the Warwickshire Wildlife Trust to protect this iconic native species. The project has already benefitted from over 630 hours of volunteers’ time but is looking for more people to get involved. 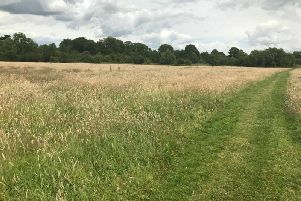 Work includes seeding and planting canal and river banks with wildflowers that thrive in wet conditions and cutting down hazel, willow and blackthorn to nearly ground level. Volunteers have learnt this ancient technique, known as coppicing, which allows more light onto the bankside and help wildflowers to grow. People have also received free training in the traditional art of hedgelaying, revitalising old blackthorn, crab apple and hawthorn encouraging more fruit to grow for water voles along canal pathways. Currently much of the canal edge is concreted or lined with metal, meaning water voles can’t get out onto the bank to feed. New water vole platforms and ladders will be built out of coconut fibre and sited by the canal edges. The trust is also trialling new designs for water vole platforms, which act as stepping stones, weaving them from willow and hawthorn. “This National Lottery Funding is vital to our new ‘Saving Ratty’ Water Vole Recovery Project,” Mr Precious added. Anyone interested in volunteering should contact Mr Precious by emailing tim.precious@wkwt.org.uk or calling 07464 486277.